Of the 151 countries Jessica Nabongo has traveled to, 47 of them have been solo trips. In her quest to be the first black woman to visit every nation in the world, sometimes she’s had to go it alone. But this isn’t something she minds. Nabongo is one of many women who are embracing solo travel. According to a 2014 Booking.com survey, 72 percent of American women like to travel solo. Research company Hitwise found that the 55 percent solo travel searches in the United Kingdom are made by women, driven in particular by women ages 25-34 living in London. You’ll find the most prominent manifestation of this trend on your Instagram feed: a slew of square frames, each holding a lone woman plus a Portuguese beach or a Colorado mountain top or an Indonesian hut. Women today have more means and fewer obligations than women of past generations. Logistically, travel is just more doable. But it’s not just increased access and time that have prompted women to travel, it’s the perception that travel is self-care. Taking a vacation is a shortcut to wellness and self-actualization, two things in which women are investing lots of time and money. 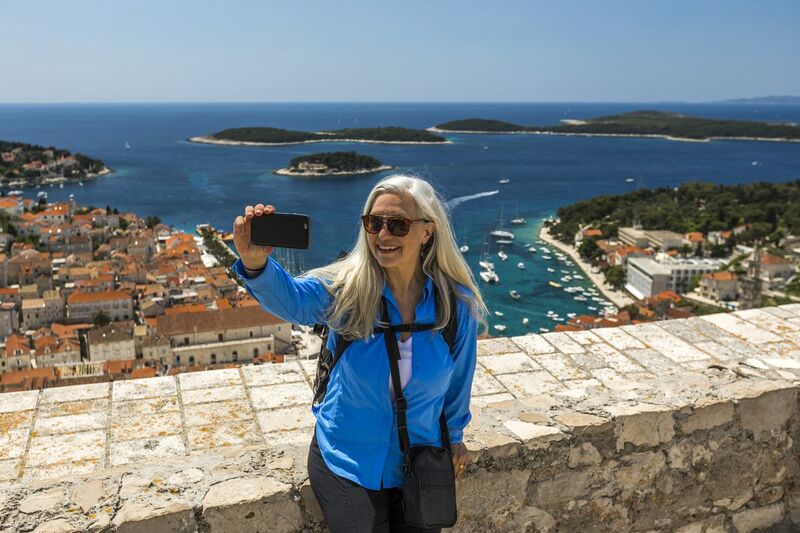 “Today’s women are inheritors of this concerted effort by a lot of women to travel more starting in the 18th century and onwards,” travel writing researcher Carl Thompson says. In fact, the world’s earliest travel writings were produced by a woman named Egeria. In 381 AD, she climbed Mount Sinai on her pilgrimage from what is thought to be either Spain or Rhone Valley to the Holy Lands. The letters she wrote on her journey are regarded as the first travel memoir. Although women are portrayed as fixtures of the home, Thompson says that historically there has been a gap between how much women have traveled and what has been recorded. Travel wasn’t encouraged or acceptable for women, so many who did travel didn’t draw attention to it. “We’ve lost a lot of knowledge about what traveling women did because they didn’t advertise it,” he says. The lack of records led to the assumption that women didn’t travel, but historical findings about women like Egeria prove this wasn’t true. By the 18th and 19th centuries, however, women were producing impressive travel writings. In 1857, Mary Seacole published one of the earliest autobiographies by a mixed-race woman, on her experience as a traveling nurse, titled Wonderful Adventures of Mrs. Seacole in Many Lands. In 1890, journalist Nellie Bly documented her trip around the globe in a book inspired by the fictional novel Around the World in Eighty Days. Bly’s book was entitled Around the World in Seventy-Two Days. Thompson explains that women’s travel writing has always differed from men’s in being “cunningly double voiced.” Women spend more time in their memoirs acknowledging the fact that they are women, and sometimes apologizing for it. “One persona on the surface will be, ‘Oh look at me, I got thrown into this situation, lord what is happening,’ and the other part of persona will be, ‘But while I was here I found 20 species of fish and these new species of plants’,” he says. Even in modern travel writings, there is that sense a woman needs a reason to travel and must recognize that her adventure is not congruent with where she is supposed to be. Wild author Cheryl Strayed hiked the 1,100-mile Pacific Crest Trail only after a slew of debilitating life changes, including her mother’s death and her own heroin use. Liz Gilbert’s famous quest in Eat, Pray, Love was prompted by her difficult divorce and failed rebound relationship. These stories are inspiring but also uphold the status-quo that women need a good, big reason to leave. It’s only in recent years that mass amounts of women have logistically been able to puzzle travel in, thanks to greater freedom in their personal lives. According to Pew Research, the age at which women become mothers has been on the rise since the 1960s. Another studyfound that the average age that an American woman has her first baby is 26, up five years from what it was in 1972. And in New York and San Francisco, this number jumps to 31. Concurrently, marriage rates have been dropping. In 2017, 50 percent of adults 18 and older in the US were married, but in 1962, 72 percent were. Women are also outpacing men in education and earning more than ever (although still not as much as men). Data from the US Department of Education shows that 60 percent of college students are women. And from 1975 to 2016, the percentage of women making under $30,000 dropped from 79.6 percent to 58.1 percent. Statistically, women have traded in marriage and kids for careers. They have more money and more flexibility, and like millennials at large are searching for fulfilling experiences. This all leads to two weeks in Buenos Aires, or a similar destination, with that cash and time going towards a trip that promises the kind of soul-deep gratification traditionally sought from home life. So why aren’t men doing the same? Psychologist Lisa Marie Bobby says the relatively low rate of male solo travel has a lot to do with how men relate to their partners. Men, she says, do relationships through activities. Their way of bonding with another person may involve playing video games or going bowling, whereas women bond through conversation and often by simply passing time with one another. So when men think of traveling, they think to do it as a pair or group activity. She adds that men also aren’t the most proactive. “Sometimes, when left to their own devices, men don’t do things,” she says. The gender disparity could also be because the desire to better yourself through self-reflection is something women are psychologically more prone to do, Bobby explains. “Not always, but many times, men tend to be less self-aware and less connected to ‘Who am I? What makes me happy? What do I want to get out of my life?’ kinds of questions,” she says. Interest in personal growth is something the travel industry has also picked up on and sells as Transformative Travel. According to a poll by Skift, 54 percent of respondents said transformation was an important aspect of traveling. In their 2018 report “The Rise of Transformative Travel,” Skift concluded that the global travel economy is shifting from a focus on “esteem” to “self-actualization,” and travelers are buying services that they perceive as being able to induce quick and complete change. “Traveling with a partner or group of people can take you away from the meaningful kind of personal growth-oriented experience and orient you toward activities and the day-to-day stuff,” Bobby says. The idea that self-care must be done alone, and that travel can be self-care, has resulted in many solo plane tickets being booked. The stampede of globe-trotting women see travel as an investment in themselves, not simply a sightseeing opportunity. And when you view a trip as a sort of therapy, it’s much easier to buy a ticket. Janice Waugh took her first solo vacation (to Cuba) when she was 49. Her husband of 20 years had recently passed away, her kids were mostly out of the house and Havana was, well, there. “The first day and a half was really hard, and I wasn’t certain I could make it,” she says. “But I hung in there, and by the second day I started getting my feet on the ground.” Janice, now 62, travels solo about three months of the year; she’s visited India, Chile, and most of Europe. She also runs Solotraveler.com, a site that gives tips on how to travel alone. It’s these kinds of personal discoveries that travel seems to promise — you will come back from Barcelona with some worldly wit, a new positive perspective, maybe even some fresh confidence.